This Prairie Schooler pattern started out as a gift for a friend, but I got delayed by carpal tunnel problems and missed completing it in time. So instead I inserted the finished work into a glass-topped serving tray until I can get or make a suitable frame in just the right size. This was stitched on 18-count Aida cloth and the finished size was only 4.25″ x 4.25″, so I’m planning on making a 6″ x 6″ (insert size) frame. 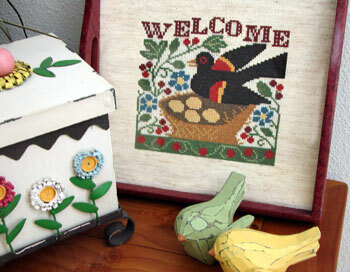 Prairie Schooler is my all-time favorite cross stitch designer.